Do not overload the elevator beyond the stated capacity. Enter and exit carefully. Observe the entrance floor. Step up or down if elevator floor and hall floor are not level with each other. Paying attention will prevent passengers from tripping. Step over the gap. Before entering, stand aside and allow exiting passengers to get off. The stop button switch should only be used when it is absolutely necessary to stop the elevator. 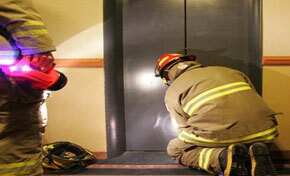 Do not attempt to stop the running elevator from the lobby by forcibly open the car door or hall door. You may loose your hands while doing so. The "Emergancy Brake Release Device" is available in the machine room enable the elevator to be brought to nearest floor. This must be used only by authorised person Children under twelve years of age should not use the elevator unless accompanied by an adult.